Cornices. That's what you think of with regard to Garbh Choire Mór. The snowiest corrie in Scotland is usually ringed by enormous cornices, barring access to some of the appealing gullies beneath them. Pinnacle Gully usually offers a break in the cornice, but the other gullies may only succumb with an abseil, an ascent to below the cornice, or a very late season gamble. The lines are generally short in the upper corrie, and more than half of the total descent of each line will be below the cliffs in the corrie itself. However, it is a stunning place to ski, and well worth the considerable effort to get there. The lower corrie, which can be found between the main corrie and Sgor an Lochain Uaine, has less defined features, but offers longer descents. As per Cairn Toul and Sgor and Lochain Uaine, you can approach from the south via Coire Odhar, skirting the summits of Cairn Toul and Sgor an Lochain Uaine, or follow the Lairig Ghru and then into Garbh Choire Mor itself, passing the Garbh Choire Refuge. From the North, the best approach is to cycle up Gleann Einich and ascend Coire Dhondail to the plateau. The down side of this approach is that you must climb back out of the corrie again no matter what. The easiest line through the cliffs is up Pinnacle Gully, which you may well find steeper on the way up than it felt on the way down! Alternatively, the nose between Garbh Choire Mór and Garbh Choire Dhaidh offers a straightforward ascent. If heading back to Deeside, and you want to get another run done on the way back (such as on Cairn Toul - recommended! ), then you can ascend to just above the col between Garbh Choire Mór and Sgor and Lochain Uaine (NN947976) up a shallow ridge which is accessible from the lower corrie. Late in the season, there should be a break in the cornice. The broad slope to the climbers right of West Gully offers a not too steep ascent also. If heading for this from the upper corrie, there is a ramp line that cuts across the buttress at the level of the upper corrie floor, bringing you onto the slope of West Gully about half way up. The South facing slope on the North side of the corrie provides a pleasant descent, particularly to salvage a trip when the cornices prohibit doing anything else. and the obvious snowfield and striking diagonal chimney that splits West Buttress (between Forgotten Gully and West Gully) was skied by Aaron McLean. There is one relevant Scottish Avalanche Information Service forecast for Braeriach - Garbh Choire Mór. The top of this gully can often be the only break in the cornice ringing the top of Garbh Choire Mor. A short neck of snow to the first pinnacle provides the weakness, allowing you to slide in from skiers left. As far as Grade I gullies go, it is very steep for the grade, but it is short. Late in the season, it banks out to more of a slope than a gully, but even in these conditions, it will feel steep. Pinnacle Gully is a contender for the longest surviving gully line in the country due to it's altitude and aspect. Solo Gully is another line in Garbh Choire Mór that is often capped by a horrendous cornice. The gully itself is very short, and not particularly deeply defined, but a nice satisfying steep ski. Finding conditions that permit a descent is the challenge! When viewing from the East, the gully can form one leg of an "X" if there is enough snow to fill both branches. The main gully line, which holds snow the longest, slants from left to right when viewed from below (right to left from the top). Entrance to this can be extremely difficult due to the cornice. In May 2014, there was a break in the cornice at a rock outcrop between the branches of the gully, that allowed a short scramble down to a slumped section of the cornice. From this point, it was possible to put skis on, and enjoy a steep but uncomplicated descent. A narrowing at the base of the gully regularly has a crack in it. This was reasonably sizeable in 2014, but the landing is at a more amenable angle than the gully! Although not attempted, the other branch of the "X" from the top may offer an alternative entry. This branch leads up to the top of Sphinx Ridge, which separates Solo Gully from the small amphitheatre containing Sphinx Gully and Pinnacle Gully. The cornice can be less problematical at this point, but you are positioned directly above Sphinx Ridge, and the gully below is much narrower with a possible awkward entry, so it carries more risk. Notes: Often has a prohibitive cornice. The straight corridor of Great Gully is the widest of the gullies in the upper corrie. It offers an uncomplicated descent, assuming the cornice is not an issue. The thing is, it often is! After a thaw, massive blocks sit perched over the gully. It has been known for the gaps under the blocks to be big enough to scramble down under, giving access to the gully below. Alternatively, it may be possible to climb the gully to below the cornice, then ski/board from there. After a very sustained thaw, the blocks eventually succumb to gravity, leaving a smooth slope to descend from the top. The top few metres are the steepest (in excess of 50o), but soon lie back to about 45o for the remainder of the gully. The gully itself is quite short, as are the others in the upper corrie, but the angle is sustained to the corrie floor, so it's worth keeping going! Notes: Uncomplicated ascent/descent, assuming no cornice. 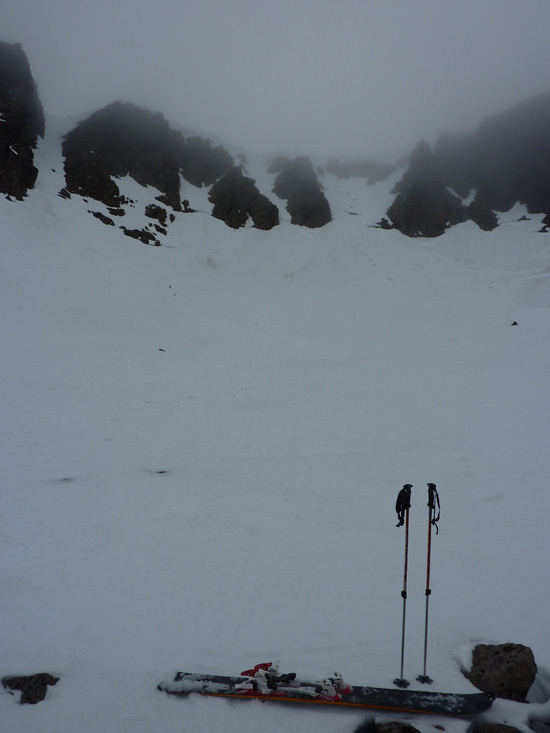 West Gully is the wide open basin that divides the upper and lower corries. 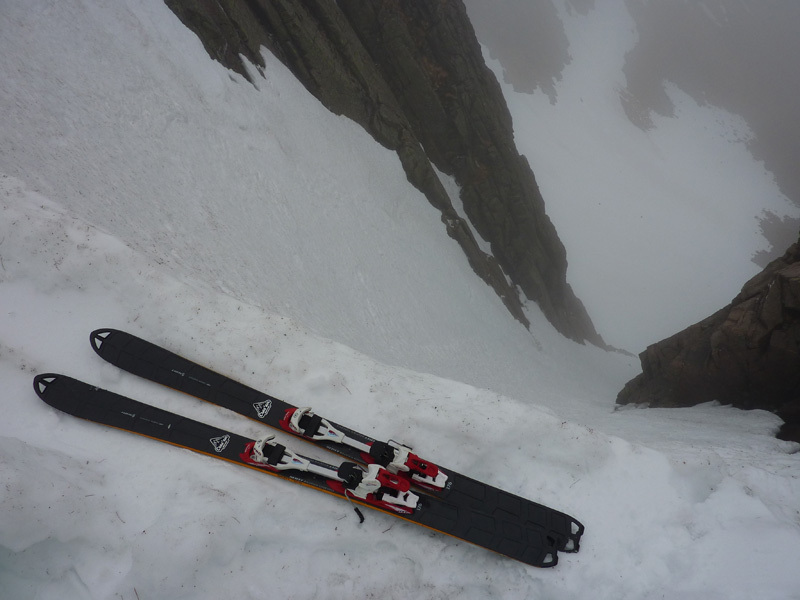 It offers an easier angled ski to the gullies in the upper corrie, and can provide a gentler warm up/warm down. There are a few possible entrances, all cornice dependent, and these can provide access to the corrie rim from the corrie floor. The one marked forms a small funnel at the top of the cliff, and before you know it, the angle lies back considerably. Notes: Only just Grade I at the very top, then the angle eases. As the ground rises towards Carn na Criche from the col with Sgor and Lochain Uaine, a shallow gully bounds the East side of "West Buttress" (which is bounded on the West side by, yes you guessed it, West Gully). In a reasonable snow year, this gully is virtually obscured, and capped by a massive cornice. In lean times it becomes more distinct, and is definitely worth doing if you can get to it. It is steeper and narrower that either Col Gully or West Gully. Climbing guidebooks are a little vague in this area, and appear to only refer to 2 gullies in relation to the area of the lower corrie that includes Col Gully, this line, and West Gully. As a result of this, and the regularity of it being buried, i've given it the name "Forgotten Gully"! 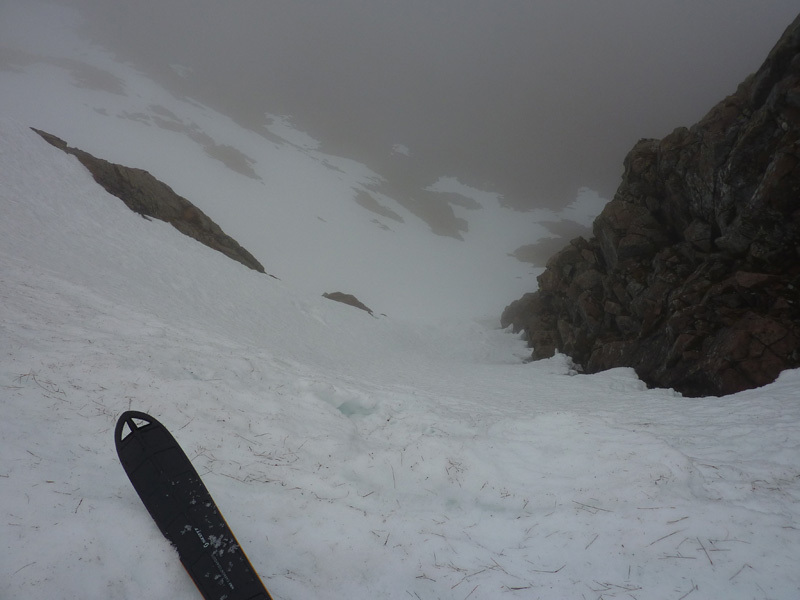 It's worth noting that on the day of the descent pictured, the gully was completely ascended, but the top few metres were icy, so a return was made from the corrie floor, putting the skis on a few metres below the top. Notes: If not banked up, average for Grade I. Cornice can feel steep and exposed. The top of Col Gully is located at the col between Carn na Criche and Sgor an Lochain Uaine. It starts on the Sgor an Lochain Uaine side of the col. Other than a potentially sizeable cornice, the gully lacks the character of other lines higher up in the corrie, but is a worthwhile descent if you are looking for something a little less steep than Pinnacle / Solo / Great Gully, for example. There is a small rock fin on skiers left which defines that side of the gully. Notes: Straightforward, other than the cornice!